Tax2efile is a premiere tax e-filing service! Tax2efile offers an IRS approved online tax filing service to help individuals and businesses file their federal tax returns and extensions. With Tax2efile, taxpayers are able to file their taxes electronically without hassle, and are expedited through the taxing process. The IRS 2290 form, Heavy Vehicle Use Tax (HVUT) is a Federal Excise Tax that is imposed on heavyweight highway vehicles with a gross weight of 55,000 pounds or more. The IRS 8849 form is used to claim a refund of excise taxes on certain fuel related sales and previous 2290 filings. The IRS 1099 forms are used to report various types of income you have received throughout the year that is not a salary paid by an employer. The forms we offer are the 1099-MISC, 1099-INT, and 1099-K. The IRS 1040 form is used for all taxpayers to file their annual income tax return. This form also allows individuals to file a claim for deductions, expenses, and credits. The IRS 4868 form is a request for an extension of up to 6-months to file for an individual tax if the return will not be completed by the April 15th due date. However, this extension form must be filed by April 15th. The IRS 8868 form is filed by an exempt organization to request an automatic 6-month extension of time to file its return. The IRS 1098 forms are used to report payments made that are deductible from an individual’s taxable income. The forms we offer are the 1098-MORT and the 1098-T. The IRS 7004 form is used to file for an automatic extension of time to file your business tax return for a partnership, a multiple member LLC filing as a partnership, a corporation, or s-corporation. The IRS 990-N form is filed by small tax-exempt organizations whose annual gross receipts are normally $50,000 or less. "Thank you!! I am so appreciative of your help, and look forward to using your services in the future." "Thanks for the great customer service. Your site was easy to use, inexpensive, and your customer service team answered every question I had promptly and helpfully." "I must say that your web site is quite easy to use and everyone I spoke to was quite helpful. I seldom have occasion to say that, so you should take it as a huge compliment. Bravo!" Our ETAX2290 app allows you to file 2290 tax return on the go. With a few simple steps, you can file your 2290 form and receive your Schedule 1 in minutes! If you are a new user, register with us, or if you are already an existing user, login with your email-id and password. After logging in, enter your business information, the gross weight of the vehicle, and select the appropriate payment method. After reviewing the entered information, submit the return to the IRS. Let us help you! 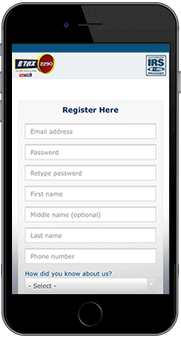 Download the free ETAX2290 app now and e-file from anywhere! Coming soon – The 1040 IRS Tax Form! The 1040 tax form is the United States Individual Income Tax Return. This form must be used by all taxpayers who file their annual income tax return. The 1040 tax form allows individuals to file a claim for deductions, expenses, and credits. You must e-file the 1040 tax form by the April 15th deadline.